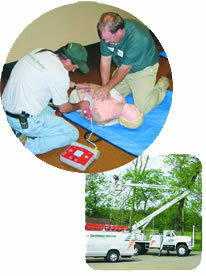 Because Southeast Electric has such an outstanding safety record, your business benefits in a variety of ways. Cost is a major consideration when you hire an electrical contractor, and our workers compensation rating makes Southeast Electric an affordable ­­ and safe ­­ electrical contractor. By making our commitment to safety a top priority, Southeast Electric has consistently earned Construction Safety awards for “0” Lost Time Accidents. Our safety advisors, Fortier Loss Control Consultants , are industry recognized as being the best in their field. By maintaining 10-hour OSHA certifications for all field employees and 30 hour OSHA, CPR and First-Aid certifications for all supervisors and technicians, we continuously meet and exceed the OSHA and TOSHA local and national requirements. From Ground Fault Circuit Interrupter (GFCI) testing to weekly on-site safety inspections by Fortier, we take pride in our financial, as well as our personal commitment to safety. We put great emphasis on safety at Southeast Electric not because it is required by law, but because it is important to our employees and their families; and because it ultimately translates into good work for our clients. Our safety awareness also benefits your company as we provide complete and thorough safety inspections of all your electrical systems. Systems and Process to Ensure Safety.